Yoga is a word very commonly used in the world today and carries various connotations depending on its usage. It has been defined in various manners as an art and science, as well as the process of conscious evolution. Swami Gitananda Giri (Giri, 1976) has defined Yoga as fivefold awareness that includes the initial awareness of how unaware we are, which is followed by a step-by-step development of the awareness of one's body, emotions, and mind, with the final step being an ultimate awareness of awareness itself. Yoga may be understood as being both the tool and the actual process of unification or holistic integration resulting in the union-reunion-communion of our individuality with our universality. In modern times, the best way to understand this great way of life is as a conscious performance of skillful action without expectation. The multi-pronged approach of Yoga has a lot to offer humanity as we all can gain a lot from the bountiful dimensions of Yoga [Figure 1], enabling us to manifest our inherent divinity, the universal potentiality that lies dormant unless channelized. "All souls are potentially divine," said Swami Vivekananda (Nagarathna & Nagendra, 2001) and, indeed, they are. However, most of us never wake up to this inherent greatness that lies within each and every one of us, and this is where Yoga offers us a light into our own selves. It dispels our confusions, and as Arjuna said to Yogeshwar Krishna (Chidbhavananda, 1984), "I see, I see; the scales have lifted from my eyes." 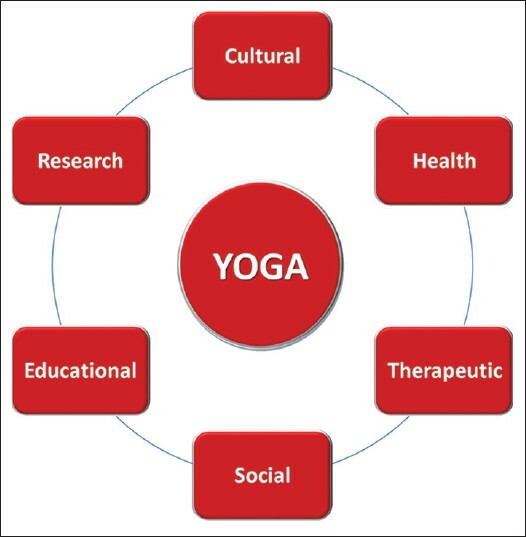 The diverse dimensions of Yoga [Figure 2] that we will be focusing on include those related to Indian culture, health, therapy, society, education, and research. Yoga is the cultural heritageof India and the great Rishis are the ancestors of all those who live a life of Yoga, in more ways than one. Spirituality is in the very genes of humans, and this physical and spiritual genetic potential enables us to experience the transcendental concepts of Yoga in their fullness. However, we are hindered by the widely prevalent ignorance of the treasures we have inherited. We have forgotten that we are the safe keepers of these treasures. These encompass the vast literature of Vedas, Upanishads, and the classical texts such as the Yoga Sutras, Hatha Yoga texts, Tirumandiram, Tirukkural, etc., (Anantharaman, 1996). All of the fine arts like music, dance, drama, pottery, painting, handicrafts, as well as the vibrant folk arts have a deep element of the spirituality of Yoga running through them. This is also visible in our day-to-day life as Yogic concepts deal with how we eat, sleep, get up, interact with others, etc. (yuktāhāravihārasyayuktaceshtasykarmasuyuktasvapnāvabodhasyayogobhavatiduhkhahā BG-VI: 17). As this verse tells us, Yoga destroys the suffering of those who are balanced in diet, relaxation, effort, sleep, and wakefulness (Chidbhavananda, 1984). The psychological health benefits of Yoga include better somatic and kinesthetic awareness with improvement of mood and subjective well-being. Improvement is also seen in self-acceptance, self-actualization, and social adjustment, with a decrease observed in anxiety, depression, and hostility (Sharma, Gupta & Bijlani, 2008). There is improvement of various cognitive functions such as attention, concentration, memory, and learning efficiency. Psychomotor functions such as grip strength, balance, dexterity and fine motor skills, eye-hand coordination and reaction time, steadiness and depth perception, and the integrated functioning of body parts improve (Bhavanani, 2013, 2014). Yogi Swatmarama in the Hathayoga Pradipika, one of the classical Yoga texts, gives us the assurance, "One who tirelessly practises Yoga attains success irrespective of whether they are young, old, decrepit, diseased or weak" (Bhatt, 2004). He assures us that Yoga improves the health of all alike and wards off disease, provided we properly abide by the rules and regulations (yuvāvrddho'tivriddhovāvyādhitodurbalo pi vaaabhyaasaatsiddhimaapnotisarvayogeshvatandritah-HathayogaPradipika I: 64). Yoga works toward restoration of normalcy in all systems of the human body with special emphasis on the psycho-neuro-immuno-endocrine axes. In addition to its preventive and restorative capabilities, Yoga also aims at promoting positive health that will help us to tide over health challenges that occur during our lifetime. This concept of positive health is one of Yoga's unique contributions to modern healthcare, as Yoga has both preventive and promotive role in the healthcare of the masses. It is also inexpensive and can be used along with other systems of medicine in an integrated manner to benefit patients. 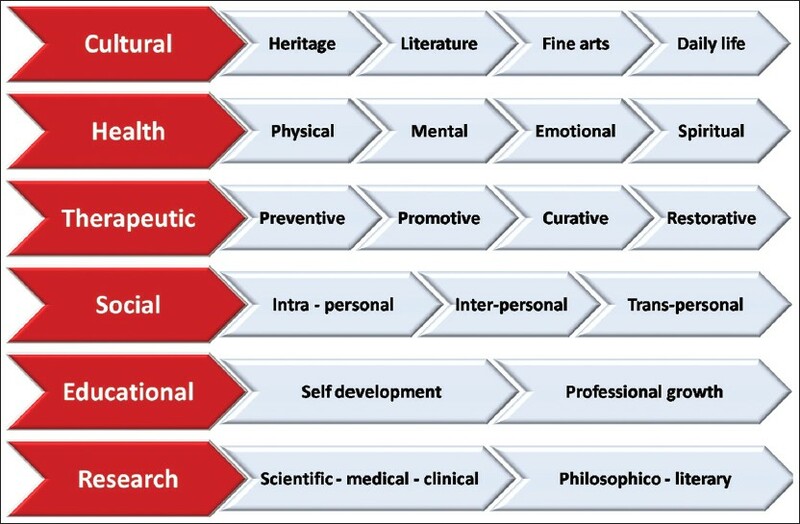 Modern medical advancements provide the rationale for the integration of various traditional healing techniques including Yoga to promote healing, health, and longevity (Madanmohan, 2013). It is imperative that advances in medicine include the holistic approach of Yoga to face the current challenges in health care. The antiquity of Yoga must be united with the innovations of modern medicine to improve the quality of life throughout the world. No wonder that Dr. Dean Ornish, the eminent American doctor who has shown that Yogic lifestyle can reverse heart disease, says, "Yoga is a system of perfect tools for achieving union as well as healing" (Bhavanani, 2012). Today we are faced with numerous debilitating chronic illnesses related to aging, environment, and hedonistic lifestyle, such as cancer, diabetes, osteoporosis, and cardiovascular diseases, as well as many incurable diseases such as AIDS (Acquired immuno deficiency syndrome). Modern medical advancements provide the rationale for the integration of various traditional healing techniques including Yoga to promote healing, health, and longevity. While modern medicine has a lot to offer humankind in its treatment and management of acute illnesses, accidents, and communicable diseases, Yoga has a lot to offer in terms of preventive, promotive, and rehabilitative methods in addition to many management methods to tackle modern illnesses. While modern science looks outward for the cause of all ills, the Yogi searches the depth of his own self. This two-way search can lead us to many answers for the troubles that plague modern man. Physical therapies: Asanas (static postures), kriyas (systematic and rational movements), mudras (seals of neuromuscular energy), and bandhas (locks for neuromuscular energy) gently stretch and strengthen the musculoskeletal system in a healthy manner. They improve the mobility and flexibility of different joints and groups of muscles. There is also concomitant improvement in the systemic functions such as respiration, circulation, digestion, and elimination. A general sense of health and well-being is also promoted by these aspects of Yoga that help release feel-good hormones like endorphins and enkephalins. Emotional therapies: Swadhyaya (introspectional self-analysis), pranayama (techniques of vital energy control), pratyahara (sensory withdrawal), dharana (intense concentration), dhyana (meditational oneness), and bhajana (devotional music) stabilize emotional turmoil and relieve stress and mental fatigue. They bring about an excellent sense of emotional balance that is vital for good health. Individual and group work is important to achieve proper emotional balance that is essential for good health. Development of healthy psychological attitudes: Yoga encourages us to step back and take an objective view of our habitual patterns of behavior and thoughts. This enables us to cope better with situations that normally put our bodies and minds under strain. Patanjali emphasized the need to develop the following qualities in order to become mentally balanced human beings: Vairagya (detached, dispassionate attitude), chittaprasadanam (acceptance of the Divine will), maitri (friendliness toward those who are at peace with themselves), karuna (compassion for the suffering), mudita (cheerfulness toward the virtuous), upeksha (indifference and avoidance of the evil), etc. Mental therapies: There are a great many Jnana and RajaYoga techniques of relaxation and visualization that are useful. Other practices such as trataka (concentrated gaze), pranayama, pratyahara, dharana, as well as dhyana may also be utilized. Relaxation is a central element in Yoga as it is the body's own way of recharging its cells and helps to ease physical, emotional, and mental tensions. Spiritual therapies: Swadhyaya, satsangha (spiritual gathering seeking knowledge of the reality), bhajana sessions, and Yogic counselling are important aspects of Yogic therapy that are often neglected in favor of physical therapies alone. They help patients understand their inner spiritual nature and that "Oneness" is health whereas "Duality" is disease. We cannot remain lonely, depressed, and diseased if we realize that we are part of this wonderful, happy, and healthy universe. Preventive and rehabilitative therapies: Yoga has numerous preventive benefits, especially when it is started early in childhood. It helps in prevention of accidents by increasing awareness as well as agility. Improved immunity helps in preventing infectious and contagious diseases. The added benefit of starting early is that the person knows the technique so that he/she can do it if needed at a later stage in life. Psychosomatic, stress-related, and lifestyle disorders may be effectively prevented by adoption of a Yogic way of life. Yoga also offers rehabilitative therapies for most musculoskeletal conditions as well as for recovery from debilitating illnesses. The practice of Yoga also goes a long way toward prevention of disability and improving the quality of life in numerous chronic conditions. Pain relief therapies: Yoga is a useful addition to the pain relief therapies as it improves pain tolerance and provides an improved quality of life. It can be safely said that Yoga helps us endure conditions that cannot be cured. This is vital in terminal ailments where it is important that the patient has a sense of improved quality of life during their end days. Yoga can also benefit caretakers of patients with chronic or terminal illnesses, who are under great stress themselves. In our day-to-day personal and interpersonal social life, Yoga provides us with a multitude of tools, concepts, attitudes, and techniques through which we can attain inner contentment leading to happiness and spiritual realization while simultaneously creating harmony in all relationships. All psycho-social qualities essential for healthy interpersonal relationships are cultivated when we live a life of Yoga. These humane qualities include loving, understanding, innate sensibility that sees other's perspectives, compassion, empathy, respect, gratitude, fidelity, and responsibility. One who is blessed with these qualities is indeed a divine blessing to the social life of their immediate family, friends, relatives, and their society itself. Vasudeivakutumbakam (yadhumooreyyavarumkelir in the Tamil language): This means the whole world is one family, in Sanskrit. This is an excellent concept which helps one to understand that divisions on the basis of class, creed, religion, and geographic distribution are all "manmade" obstructions toward oneness. One can then look upon all as his own and can bond with everyone irrespective of any barrier. All the great Yogic saints such as Tirumoolar, Tiruvalluvar, Basava, Periyalvar, and Tirunavukkarasar have reminded us again and again in so many verses of the singular teachings that there is only "ondreykulamoruvaneytheivam"-which in Tamil means " One Humanity and One God" (Ramanathan, 2007). Jiva Karunya : Empathic compassion toward all living beings is extolled in the teachings of Tirumoolar, Tiruvalluvar, and Vallalar Ramalinga Adigalar. Tirumoolar says that the most important aspects of right living consist of the both a devoted loving offering to the Divine in daily life as well as the feeding of other human beings and animals with love and compassion. He also stresses the need of using virtuous words while talking to others as the means to spiritual upliftment. Tiruvalluvar asks us the poignant question in Tamil, "arivinaanaaguvathu undo pirithinnoaithannoypolpoatraakkadai- of what use is intelligence if one cannot empathize with the pain of others and help them?" (Ramanathan, 2007). Pratipaksha Bhavanam : The cultivation of a strong contrary attitude toward negativities must be induced in our day-to-day living as we face our own demons so many times each day. Even if we cannot replace the negative thoughts with emotion-laden positive reinforcements, we must at least make an attempt to stop them on their track. I have personally found that a strong "STOP" statement works wonders in helping block out the negative thoughts that otherwise lead us into the quicksand-like cesspool of deeper and greater trouble. Tiruvalluvar advises us to repay negative actions done to us by others with positive selfless actions toward them (Ramanathan, 2007). Karma Yoga : Selfless action and the performance of our duty without any expectations in return are the qualities extolled by Yogeshwar Krishna in the Bhagavad Gita (Chidbhavananda, 1984). This helps us to develop into an autotelic personality where we perform acts because they are intrinsically rewarding, rather than to achieve external goals. This is an important aspect of developing a state of "flow"-a state of complete absorption with the activity at hand giving one the greatest sense of bliss. Such people are more autonomous and independent because they cannot be as easily manipulated with threats or rewards from outside. At the same time, they are more involved with everything around them because they are fully immersed in the current of life. To me this represents the cream of humanity, the truly self-realized and self-actualized true human beings. As Yogeshwar Krishna tells us in the Srimad Bhagavad Gita (Chidbhavananda, 1984), karmanyevadhikaraste ma phaleshukadachana, ma karma phalaheturbhurmateysangostvaakarmani (II: 47)-"You have the right to perform the action, but not to the fruits of the action. Never consider yourself the cause of the resultant fruits, and don't let this make you cling to non-action either." Basically the key message is "Do your best and leave the rest." Choice of the right beatitude is the only way one can grow and evolve in consciousness. The true Yogic life involves a sustained struggle against past conditioning, an attempt to control one's inner environment in order to focus inward. The Yogi strives to be "more perfect today than he/she was yesterday." For those interested in taking up academic studies in Yoga, there are many short and long-term self-development courses being run by both traditional and modern centers worldwide. There are courses on personality development, efficiency enhancement, and stress management. If one is interested in becoming a Yoga professional, then such training is offered by numerous institutes and universities through certification courses for Yoga instructors, teachers, and therapists, as well as diploma and PG diploma courses. Masters, M.Phil, and PhD programs are also being run by many universities. To maintain the standard of Yoga education worldwide, a dozen eminent institutions have come together to form the Council for Yoga Accreditation International (CYAI), a peer accreditation association of Yoga certification and degree granting institutions (www.cyai.org). The International Association of Yoga Therapists in the USA (www.iayt.org) is doing a lot of work to make Yoga acceptable to the medical community worldwide. Yoga in India as a subject is governed by the Department of AYUSH (Ayurveda, Yoga and Naturopathy, Unani, Siddha and Homoeopathy) in the Ministry of Health and Family Welfare. This department runs the National Institute of Yoga (Morarji Desai National Institute of Yoga) in New Delhi (www.yogamdniy.nic.in), while it's Central Council for Research in Yoga and Naturopathy (CCRYN) wing funds and supports various research projects and Bachelor of Naturopathy and Yogic Sciences (BNYS) courses in India (www.ccryn.org).Yoga therapists have been appointed under the National Rural Health Mission (NRHM) programs in government hospitals all over the country and most major private medical hospitals are running Yoga and healthy living centers. Sri Balaji Vidyapeeth University (www.sbvu.ac.in) is a pioneer in having started the first PG Diploma in Yoga therapy course in a medical college at its Mahatma Gandhi Medical College in Pondicherry that is being conducted by the Centre for Yoga Therapy, Education and Research (CYTER). Numerous studies have been done in the past few decades on the psycho-physiological and biochemical changes occurring following the practice of Yoga. The main fields of research in Yoga are the Scientific-Medical-Clinical aspect that deals with both fundamental and applied research in various medical conditions, and the Philosophico-Literary side that tries to develop an understanding of the context and traditional basis of Yoga.Traditional Knowledge Digital Library (TKDL) has been set up by the Indian Government to try and systematize the abundant traditional knowledge in Yoga and Indian systems of medicine (www.tkdl.res.in). A great amount of published research on Yoga and its diverse applications in various fields of human endeavor is available from www.ncbi.nlm.nih.gov/pubmed. The Srimad Bhagavad Gita says, "yogaha karmasu koushalam," which means that Yoga is skill in action (Chidbhavananda, 1984). The real Yogi, immensely conscious and aware at the physical, mental, and emotional levels, gains great control over all aspects of life by using that consciousness, and thus develops a real skill in living. Part of that skill springs from his cultivated detachment, his ability to work for "work's sake" and not for the sake of the reward. He realizes that his duty is to do his best but that the ultimate result is not in his hands. The Yogi performs the needed action not for the sake of the fruits of that action, but because it is good and necessary to do so. Such an attitude of mind produces consummate skill in whatever action the Yogi undertakes. Consummate concentration and consummate control are all offshoots of good Yoga Sadhana. This belies the age-old belief that the competitive spirit produces the highest skill. To this the Yogic answer is: Detachment from the fruits of the action produces the greatest efficiency, for one is then emotionally detached with goal-oriented, competitive thinking. The beauty of Yoga is that these abstract principles become concrete during the daily practice of the techniques available in the Yoga system. Once the "seed of Yoga" finds fertile soil, these concepts grow naturally, slowly but surely taking root in all aspects of life. Yoga, which emphasizes the universal, is a perfect foil to those human activities which glorify the personal. The ego that is fixated only on its own shallow self is likely to soon run into depression and despair, overwhelmed by its own superficiality. That striving spirit which looks within at the universal aspect of its own nature and sees the oneness of the whole of creation will find an endless fountain of inspiration and joy. In short, it may be safely said that the practice of Yoga as a unified whole helps the individual shift from an "I"-centric approach to a "we"-centric approach. "Tasmad yogi bhavarjuna-be thou a Yogi,"says Lord Krishna in the Gita (Chidbhavananda, 1984). May we all grow and glow in consciousness until we reach that highest state of consciousness, the state of Yoga! The author thanks the management of Sri Balaji Vidyapeeth University for setting up the Centre for Yoga Therapy, Education and Research (CYTER) in Mahatma Gandhi Medical College and Research Institute (MGMCRI). The author is grateful to Yogacharini Meenakshi Devi Bhavanani, Director ICYER at Ananda Ashram, Pondicherry, and Prof Madanmohan, Director CYTER, MGMCRI, Pondicherry, for their constant motivation and supportive guidance. Anantharaman, T. R. (1996). Ancient Yoga and Modern Science. New Delhi: Munshiram Manoharlal Publishers. Bhatt, G. P. (2004). The Forceful Yoga: Being the Translation of Hathayoga-pradîpikâ, Gheranda-samhitâ and Úiva-samhitâ (P. Singh, R. Bahadur, and S. C. Vasu, Trans.). New Delhi: Motilal Banarsidass Publishers. Bhavanani, A. B. (2012). Yoga in health care. Annals of SBV, 1(2), 15-24. Bhavanani, A. B. (2013). Yoga Chikitsa: Application of Yoga as a therapy. Pondicherry: Dhivyananda Creations. Bhavanani, A. B. (2014). Yoga: A novel integrative therapy. NisargopacharVarta, 6,(5) 13-15. Chidbhavananda, S. (1984). The Bhagavad Gita. Trichy, Tamil Nadu: Ramakrishna Tapovanam Publishers. Giri, G. S. (1976). Yoga: Step-by-Step. Pondicherry: Satya Press. Innes, K. E., Bourguignon, C., & Taylor, A. G. (2005). Risk indices associated with the insulin resistance syndrome, cardiovascular disease, and possible protection with yoga: A systematic review. Journal of the American Board of Family Practice, 18(6), 491-519. Innes, K. E., & Vincent, H. K. (2007). The Influence of Yoga-based programs on risk profiles in adults with type 2 diabetes mellitus: A systematic review. Evidence-Based Complementary and Alternative Medicine, 4(4), 469-486. doi: 10.1093/ecam/nel103. Khalsa, S. B. (2004). Yoga as a therapeutic intervention: A bibliometric analysis of published research studies. Indian Journal of Physiology and Pharmacology, 48(3), 269-285. Madanmohan, T. (2013). Yoga for healthy lifestyle. Annals of SBV, 2(2), 20-23. Nagarathna, R., & Nagendra, H. R. (2001). Integrated approach of Yoga therapy for positive health. Bangalore: Swami Vivekananda Yoga Prakashan. Ramanathan, M. (2007). Thiruvalluvar on Yogic Concepts. Pondicherry: Aarogya Yogalayam. Sharma, R., Gupta, N., & Bijlani, R. L. (2008). Effect of yoga based lifestyle intervention on subjective well-being. Indian Journal of Physiology and Pharmacology, 52(2), 123-31. Streeter, C. C., Jensen, J. E., Perlmutter, R. M., Cabral, H. J., Tian, H., Terhune, D. B,… Renshaw, P. F. (2007). Yoga asana sessions increase brain GABA levels: A pilot study. Journal of Alternative and Complementary Medicine, 13(4), 419-26. doi: 10.1089/acm. 2007.6338.